On Sunday, Scotsman Andy Murray did one of the most unrelatable things in the world. He played in the final match of this year's Wimbledon tennis championship in front of such viewers as the Duke and Duchess of Cambridge, Prime Minister David Cameron, and Bradley Cooper. Then, he won. As totally remarkable of a Sunday as that is, there's one photo from Andy Murray's second Wimbledon victory that might make you say, "Me." Murray defeated Canadian Milos Raonic to win the coveted Wimbledon men's singles' title on Sunday; Raonic was the first Canadian to advance to the men's final in Wimbledon history. 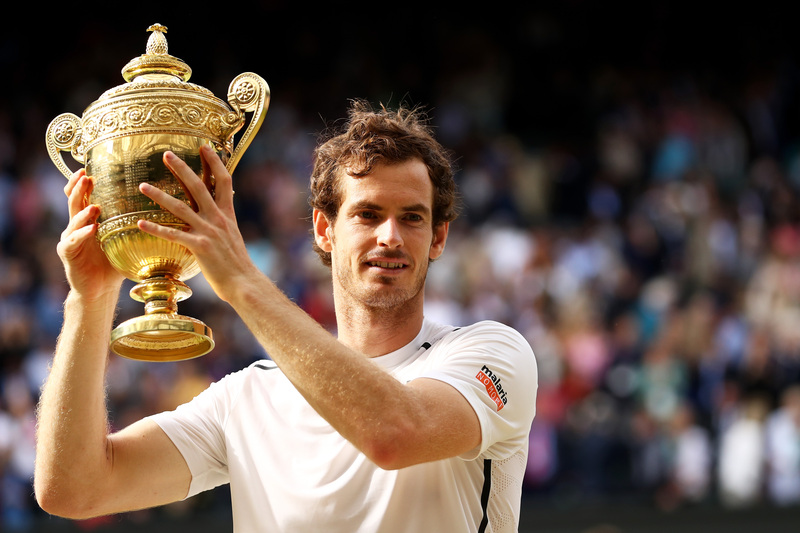 In 2013, Murray beat Serbian Novak Djokovic to win his first Wimbledon title. That year, Murray also became the first British player to win the men's singles title in 77 years. Needless to say, Sunday, like the 2013 final, was a big day. If there were ever a time to resemble the "praise hands" emoji, then a Wimbledon victory is it. An Olympic victory might also warrant such behavior, and Murray will reportedly have the opportunity to make that happen next month when he represents Great Britain in Rio, along with six other team members. Not to mention, Murray will enter the Olympics as both the reigning Wimbledon champion and the reigning Olympic gold medalist. In 2012, Murray won the men's singles tennis gold after defeating Swiss superstar Roger Federer. While accepting the Wimbledon title and trophy on Sunday, Murray took note of his unique position in tennis — and his country's unique position in history. "I think playing in a Wimbledon final is tough, but I certainly wouldn't like to be a Prime Minister," Murray said, acknowledging Cameron's presence at the match. Meanwhile, the U.K. actually is looking for a new prime minister, thanks to last month's game-changing Brexit vote. If your Sunday was dominated by Netflix, brunch, and scrolling through Instagram, that's totally relatable. When it consists of something a little extraordinary, take a note from Murray's book and go full-on praise hands. It's a relatable reaction to superb happenings.